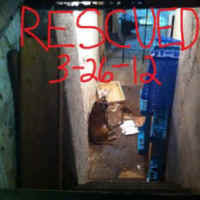 Shine, Imprisoned in the Cellar of a Harlem Bodega for 6 years - Rescued! 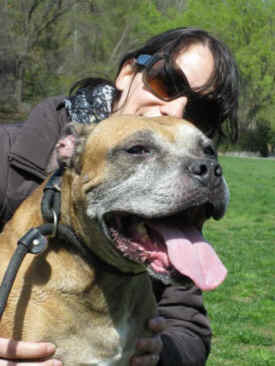 Meet Shine, the precious pit bull mix who spent the last six years of his life in the cellar of a Harlem bodega. Day in and day out this gentle soul sat looking up towards the doors that separated him from the outside world, hoping that someone would hear his cries and help him. 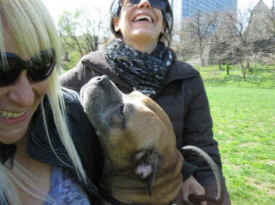 On March 26, 2012 his prayers were answered when Christine Drakatos and I freed him. Christine and I had both heard about Shine this past October on Facebook, but Christine had been told by the person that alerted the public to his horrifying living conditions that Shine was being rescued by other rescuers. I was stunned when I received a phone call recently from a concerned PETA employee named Chris Fontes asking for help in freeing Shine. I immediately called Christine, who like myself, was devastated to find out that he had been in the basement this whole time. On Friday, March 23rd I went to see Shine for myself. The “owner” brought me down to the basement where he was chained and kept on a pronged collar. He informed me that the ASPCA had been there multiple times and never removed Shine. It seemed to me that the “owner” took this as some sort of confirmation that Shine’s living conditions were fine, which they were not. But this is not a surprise to me as the ASPCA continually betratys the animals they are supposed to protect. Shine gently took lots of treats from my hands all the while wagging his tail. The “owner” wouldn’t release him to me that Friday but agreed to release him the next Monday. 111 Street & Frederick Douglas Blvd. On Monday, March 26th Christine and I arrived at the bodega on 111th Street and Frederick Douglas Blvd at 12pm. We went in and I told the “owner” we were there for Shine. He came outside to talk to us and Christine explained to him repeatedly that this was no life for Shine and that he deserved better. It quickly became clear that the “owner” was never going to release Shine out of the goodness of his heart. So Christine told him “We will give you $200 for Shine, here is my leash, go get him.” And with that the man disappeared into the bodega. 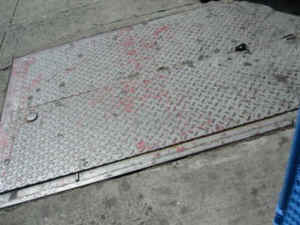 Minutes later the metal doors opened up to the street and Shine hurried up the stairs, emerging from the dark basement. As he handed the leash to Christine I handed the man the money. The three of us walked down the street away from the bodega and never looked back. Shine was finally free and never again would he suffer. We went to a nearby park where we sat for more than an hour with Shine. He showed Christine and myself nothing but love giving us kiss after kiss, all while enjoying the grass under his paws and the sun on his face. I will never understand why someone would report that Shine had been saved when he was not. Or how so many people could have been working on helping him, yet nothing changed for him. I was told that when it was very cold outside you could hear Shine crying from the basement when you walked by. Let this be a lesson to everyone that if you are not successful yourself in helping an animal, don’t stop until you find someone who is. Shine is currently in rescue with Eleventh Hour Rescue. Linda, the President is fostering Shine and the two are enjoying getting to know each other. Not only is Linda providing Shine with plenty of love but she is also ensuring that he never wants or needs for anything again.